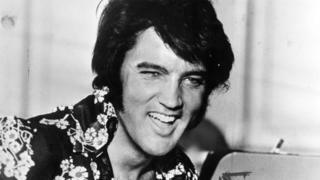 When a downward-spiralling Elvis Presley died 40 years ago on 16 August 1977, a cynical music industry insider was overheard to remark that it was a "smart career move". Apocryphal tale or not, death has given a lucrative boost to the selling power of not just Elvis, but also Bob Marley, Jimi Hendrix, David Bowie and a host of other music legends. It has also enabled a number of entrepreneurial fans of the artists in question to make a good living from selling memorabilia and other things connected to their idols. Elvis's legacy and monetary worth remain immensely strong in particular - according to Forbes' list of top earning dead stars he earned $27m (£21m) in 2016, and sold one million albums. Aged just 42 when he died of a heart attack, the singer's notorious love of unhealthy food could not have helped. His favourite sandwich was said to consist of two slices of fried bread, with crispy bacon and fried bananas, smothered in jam and peanut butter. Graceland sold 11,000 such sandwiches to visitors last year - but it was not Graceland, Memphis, Elvis' former home, rather Graceland Randers in Denmark. The tourist attraction in northern Denmark is owned by Danish-born super-fan Henrik Knudsen, 53, who built a copy of the original Graceland mansion to keep the rock 'n' roller's legend alive in Scandinavia. "I was 13 when he died, and I couldn't say it was a shock, as I wasn't that deep into him at the time, but what I recognised was this was something big," says Henrik, an honorary citizen of Memphis, who has visited Graceland in the US some 100 times. "This could have been royalty. This could have been a president." After establishing a successful Elvis fan club, his Danish replica of Graceland opened in 2011. It cost £2.8m to build the house, with museum in the basement, a function room, merchandise store, and a diner, but within six years Henrik had made enough money to pay back his investors. Yet with success came a lawsuit from Elvis Presley Enterprises, the corporate body created by the Elvis Presley Trust to manage worldwide licensing of Elvis-related products and ventures, for infringement of the Graceland trademark. In December 2015 Graceland Randers was renamed Memphis Mansions, and Henrik declines to discuss the legal aspects. Another Elvis fanatic who makes a living from his hero is London-based Sid Shaw, the owner of website Elvisly Yours, which sells Elvis-related memorabilia and products to fans in more than 50 countries. Over the years he has sold mugs, costume jewellery, magazines, books, posters, badges, t-shirts, plates, magnets, Elvis sunglasses and tapestries, among others. 'I first heard Elvis on Radio Luxembourg. And that was the only place you could hear pop music [at the time]," says Sid, now 71. "Elvis came on and was totally different to anything else, so I became a fan then." Sid started making busts of Elvis in 1977, the year of his death, and in 1978 set up a fan club. "In those days, the Elvis Presley estate didn't have a trademark, so I applied for the trademark 'Elvis', and I was told you can't get it because it is generic," he recalls. "So I applied for the next best thing which is 'Elvisly Yours'... and I got it." The phrase Elvisly Yours is the way Elvis fans around the world sign their letters. Sid says to protect himself legally he has acquired a further 38 trade marks in the UK and Europe. At the other end of the online memorabilia scale, eBay says current demand for material related to the King has seen 12 Elvis-related items sold every hour over the last three months, covering everything from mugs to masks. And there are nearly 70,000 current listings for Elvis memorabilia on the site. While Elvis fans are mainly of the same generation that grew up with him, others - such as reggae legend Bob Marley - have more cross-generational appeal. In Marley's case he has also become synonymous with Jamaica, helping boost tourism there. "Bob Marley is more than a native son, he is an icon," says Jamaica's director of tourism Paul Pennicook. The Marley legacy is overseen by The Bob Marley Group (Jamaica), which is owned by his family, and includes the Bob Marley Museum. Located in Kingston, the Jamaican capital, the museum was formerly Marley's home, and was purchased in 1975. It was transformed into a museum after his 1981 death, and attracts more than 36,000 visitors a year. Entry costs are $25 per adult, $12 per child aged four to 12 years, and $5 per student with valid Jamaican school ID. Meanwhile, products on sale related to the reggae icon include Marley Coffee, a House of Marley audio equipment range, and One Love ice-cream. Once a star dies, original memorabilia associated with them tends to climb in price. Katherine Schofield, head of the entertainment department at UK auction house Bonhams, says: "We tend to see a knee-jerk reaction in the market following the death of a collectible artists. "It takes a bit longer for the market to settle, and we can then see more accurately if prices look likely to stay higher." Since David Bowie's death in January 2016 she says there have been high prices for items related to the trend-setting musician, and "high quality lots coming on to the market". Truffle Shuffle, a firm which produces images on t-shirts, has also noted that death can boost sales. "When Bowie died, just like with his music, sales of merchandise tripled, with fans looking to get something to remind them of a cultural icon," says Claire Wood, head buyer at TruffleShuffle.com. Meanwhile, Australian street artist Jimmy C (aka James Cochrane), sold limited edition prints of a Bowie wall mural in Brixton, London, he had created in 2013. The 44-year-old sold about 120 prints for £180 each with 20% going to Cancer Research UK. "The print is connected to my artwork as much as it is to Bowie, or to be more specific, the artwork was a personal interpretation of Bowie," he says. "I believe it is legitimate for me to sell decent quality prints of my own artwork." But be warned, estates are always on the look-out for anything that crosses from homage into copyright infringement. "Our action against piracy is an ongoing one," says the Bob Marley Foundation. "We continue to encourage the public to do the right thing and report any illegal use of the image of the reggae icon."